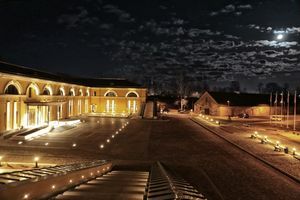 Mark Rothko Art Centre in the Artillery Arsenal of Daugavpils Fortress complex at night. Daugavpils, the second largest city in Latvia and the largest city of Latgale region. City was founded by Livonian Knights at the important intersection of medieval trade routes in 1275. The name can be translated as Daugava Castle, this applies to any other version of the name in other languages, as the River Daugava is called differently in some other countries. Original Livonian castle has been attacked, destroyed and rebuilt multiple times until 1577, when Ivan the Terrible after two weeks of siege captured the castle and destroyed it to the ground. The construction of a new fortress 19km downstream of Daugava river has been ordered by Tzar. This new fortress was completely destroyed during the great Northern War in c. 1720. By that time Latgale was part of Polish-Lithuanian Commonwealth, however after the 1st partition of the Commonwealth in 1772 the region went to Russian Empire and remained so until 1918. The city during that period was called Dinaburg. The Dinaburg Fortress, now known as Daugavpils Fortress, was started to construct in 1810 and completed in 1878. It was one of the biggest and most important fortifications of Russian Empire, built as a fortified ideal city, gradually strengthened and improved almost until 1914 when the WWI has begun. Later it was used for various military purposes by all governments until 1993, when Russia's troops left Latvia's territory. The fortress was not destroyed during the wars or significantly changed, it remains the only well-preserved this type of fortress in Eastern Europe and the last bastion-type fortress in the World. Now Daugavpils offers modern conveniences and services. Over the last decade an ice-hall, bowling center and modern hotels have been built in Daugavpils and diverse entertainment options have appeared throughout the city. The closest air port is in capital city Riga, from there one have to take a land transport to the south east. The future project Daugavpils Airport (Daugavpils Lidosta) 12km northeast of the city is being converted from the former soviet air force base and rebuild to become one of the major airports in Latvia. It is planed to be open in the near future, meanwhile the City Council consider to sell it. Valsts akciju sabiedrība “Latvijas dzelzceļš” (Latvian Train Service) operates Riga-Daugavpils route four times a day; Riga-Gomel, and Russia trains also operate. On weekends, there are several trains to/from Vilnius (3h, €9 one way ) on a rather unconfortable Soviet-type train. Rīgas Starptautiskā autoosta (Riga Bus Station), . Buses from Riga to Daugavpils leave every two hours. The drive from Riga takes 3-3 1/2 hours. There is an international highway named E262 from Kaunas, Lithuania that crosses Daugavpils and goes to Russia. SIA Daugavpils autobusu parks (DAP) (Daugavpils Bus Station), Main Office: Kārklu iela 24, LV-5403 (+371) 65429245, , . By bus you can go to any part of the city. Tickets are 0,30 LVL. Daugavpils has three tram routes operating in the city centre. Tickets are 0,30 LVL, 0,15 LVL on Sundays. Tickets are sold in the tram by a conductor (usually a woman). Exact change appreciated. When the tram is empty, best is to go to the conductor, hand her the fare, and she will give you a ticket. Otherwise she may walk around the tram collecting fares from passengers who have just got on. SIA ”HOF” (Daugavpils Taxi) 65422222, available 24 hours a day. One of the several Art Nouveau buildings in Saules street. Rigas ielā is the main pedestrian mall which starts directly across the street from the main entrance of the railway station. 19th century architecture in the center between the Daugava River and the railway station. The historical center of the city consisted of 80 cultural-historical objects presents itself a specific monument of urban construction. One may be amazed by variety of architecture styles of the buildings, the red clay bricked facades of peculiar form recognized as Latgale baroque. The church ensemble Jaunbūve, the Church Hill included churches of four confessions, contributes a lot to the very special panorama of the city of Daugavpils. Daugavpils may also be proud of its sport complex. Ice Hall and the open-air swimming pool, one of the biggest open-air swimming pools in the Baltic countries, are the real pride of the city. Daugavpils is more endowed with water space than other cities of Latvia. There are 15 lakes, 8 rivers and numerous brooks its territory. In spite of this the climate is the most continental of the country. Forests and parks make up the green area with a square of approximately 10 400 ha. With good reason the fortress, originally built as a fortification for the western border of the Russian Empire, can be considered the symbol of Daugavpils. The Classicism-style fortress was consecrated by the Russia’s tsar in 1833. In later years the tsarist, Latvian and Soviet Armies had been stationed there. At present the fortress is under the supervision of the local municipality and Real Estates Agency as a cultural and historical monument. The Daugava protecting dam, which stretches 6 km along the river and at its highest points reaches 9 m, is another singular landmark of the city. It was built in 1841, and is still protecting the city from flood-waters. On accordance with the town-building plan, confirmed by the tsar in 1826. Daugavpils present-day center and its street network started shaping in the early 19th century. The features of the styles peculiar to this historical period have been preserved in Riga street, the main street of the city center. A characteristic feature of buildings is Classicism-style red brick houses with ornamentation of various styles. 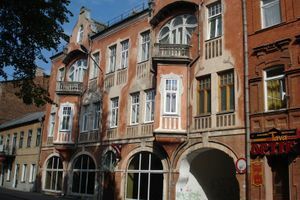 The house at 8 Riga street, which now houses the Daugavpils Local Arts and History Museum, has preserved its original architecture almost unaltered. The house was built in the second half of the 19th century. It decoration of colorful glazed files is extremely original. All entrances to the house have small glass-covered open-work metal roofs. More than a hundred years ago a 3 ha large park was laid out in the center of the city. The park is called now Dubrovin’s Park as it was created with great assistance and support of Pavel Dubrovin, the first head of the city. It has been a rest place popular with the townspeople for years. Between Riga and Saules streets there is Vienības nams (Unity House), designed in plain architectonic forms: prisms and cubes. The many halls and rooms of this building house a theater, the city central library, several shops and cafes. All the principal cultural activities of the city take place here. At the beginning the 80-ties Riga street, in which several buildings of historical and architectonic value are situated, was one of the first cities in Latvia which was used by pedestrians only. The most significant events in Daugavpils history are immortalized in various monuments and memorial places. The soldiers killed in Word War I are buried in Old Believers, Orthodox and Lutheran cemeteries. The Latvian army soldiers, killed in fights for freedom, are buried in the Lutheran cemetery. Their graves there as well as the Polish army soldier’ graves in Satiksmes iela testify to the events relating to history of the independent Latvian state. A 13 m tall reinforced concrete cross has been erected in Satiksmes iela to commemorate the events. A memorial stone to the citizens of Daugavpils, deported to Siberia in 1941 and 1945, is erected in Pumpura Park. The burial places of the Soviet and German soldiers in Dubrovin’s park, in the Garrison cemetery, in the Griva, Communal and Orthodox cemeteries as well as the graves of the victims of fascism in the Mežciems cemetery are memorial places to those who were killed in World War II. The northeast part of the city, Stropi, is a popular recreational area located near the Big Stropu Lake (Lielais Stropu ezers). The Daugavpils Musical and Drama Theater located in the Unity House (1937) in the city center. Did you know that Daugavpils has a race track 'Daugavpils Spidveja centr' on Jelgavas iela 54. So go check out some races. Want to go skating? Daugavpils has an amazing Ice hall - Ledus Halle on Stacijas iela 45a. But if you want to go bowling or shoot some pool, go to City Center on Viestura iela 8. You can also walk on the Daugavpils main street Rigas iela. It is amazing. Finally just take a walk around the city and you will see a lots of amazing and beautiful things. DAUGAVPILS TIRGUS(Market) Cietokšņa 60, Tel. 65428252. All around the city you can find many large and small supermarkets, shopping centers, or just stores. Restorāns “ Taller”, Viestura ielā 59, Tel. 65424983. Restorāns “Gubernators”, Lāčplēša ielā 10, Tel. 65422455. Bistro “Vita”, Rīgas ielā 22a, Tel. 65427706. Restorāns “PLAZA”, Ģimnāzijas ielā 46, Tel. 65404911. Bārs “Loby”, Ģimnāzijas 46, Tel. 65404912. Bārs-bistro “Vēsma”, Rīgas ielā 49, Tel. 65444350. Bistro “Grill Niko”, Viestura 25 – 1a, Tel. 65424887. Kafejnīca “Pasaules brīnumi”, Vienības ielā 17, Tel. 65920000. Kafejnīca “Mego”, Viestura 60, Tel. 65421733. Kafejnīca “Lidadis”, Rīgas ielā 14, Tel. 65476660. Look at Eat section above for restaurants and more. 'Gubernators' has a great selection of beers from Latvia and the Czech Republic on tap. Hotel "Park Hotel Latgola", Gimnazijas Street 46, Tel. 65404900, . A new three star hotel. Hotel "Villa Ksenija", Varšavas iela 17, Tel. 65434317, . Hotel "Paparde", Tērvetes street 17, Tel. 65402180, . Hotel "Rebir", Vienības street 19, E-mail: [email protected], Tel. 65421857, fax: 65424747. Hotel "Flora D", Krimuldas street 45, Stropi, Tel. 29544613, 29421497. Hotel "Leo", Krāslavas street 58, E-mail: [email protected], Tel. 65426565. Hotel "Hotel Dinaburg", Dobeles street 39, E-mail: [email protected], Tel. 654 53010, 22332243, fax: 65424747, . The Wi-Fi Internet is available almost in all cafes, hotels and restaurants in the centre of the city. For example in Park Hotel Latgola, City Centre, Vesma cafe and many others. Also there are computers with the free Internet available in the halls of Ice Hall and Hospital. There are some the Internet cafes near old university building on Saules street. From Daugavpils one can travel to Lithuania, Belarus, and/or Russia because the city is located close to the borders of these countries. Or go anywhere else in Latvia. This page was last edited on 5 December 2018, at 12:31.